Of all the summer evening sights at the Chicago Botanic Garden, only one can compete with the flowers: the brides. Beautiful in their gowns, stepping delicately into the Krasberg Rose Garden or walking down toward the fountain at the Esplanade, they trail bridesmaids and tuxedoed men and happy families. As they pass, we onlookers stop in our tracks, smile goofily, gawk unabashedly…and let our thoughts turn to romance. Over the years, the Garden has been the site of many a romantic story for both staff and visitors.With summer in full swing—and romance in the air—here are a few more of our favorites. Early on a 2013 summer evening, a seemingly random group of visitors slowly gathered at “the Ken,” the lovely green field with the photo-perfect view of the Elizabeth Hubert Malott Japanese Garden. As a young couple approached, a few people walked out on the grass, took their places, cued the music, and began to dance. 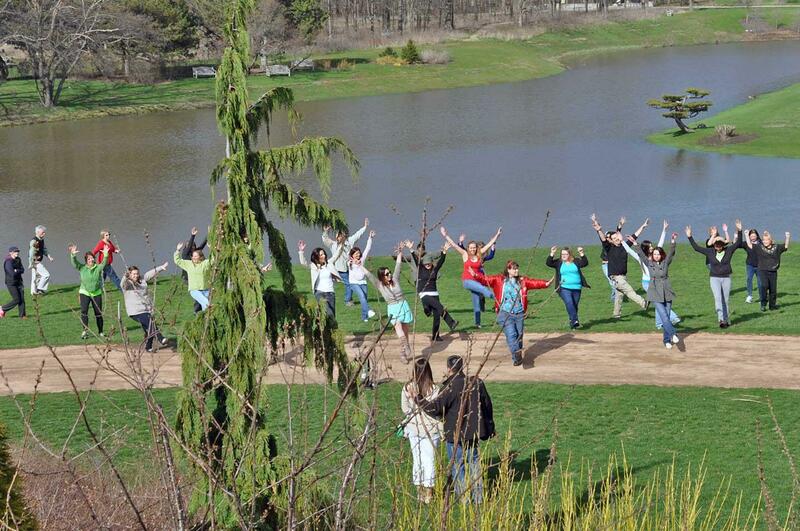 Popping up from benches and stepping out from trees, others skipped into the action…and suddenly the young man of the couple jumped into the flash mob and joined the choreography, while his girlfriend threw her hands up to her face in surprise. When the music finished, the crowd of friends and family formed an aisle, and the young man lowered to his knee to propose. The engineers in the Model Railroad Garden: Landmarks of America love to tell the story of the groom-to-be who worked closely with them on a one-of-a-kind, finely-timed marriage proposal. Strolling leisurely through the Model Railroad Garden with his girlfriend, the thoughtful young man arrived at a pre-determined spot just as a miniature train pulled up (guided by engineers in the wings). Surrounded by a curious crowd (and the wedding party-to-be), he stepped over to the track, reached down to the flower-bedecked gondola car that bore an engagement ring in a box, and dropped to one knee to ask for his lady’s hand. She said yes. She said yes—Heather and husband Tommy married in McGinley Pavilion. Like any workplace, the Garden has its share of romantic stories starring staff, too. 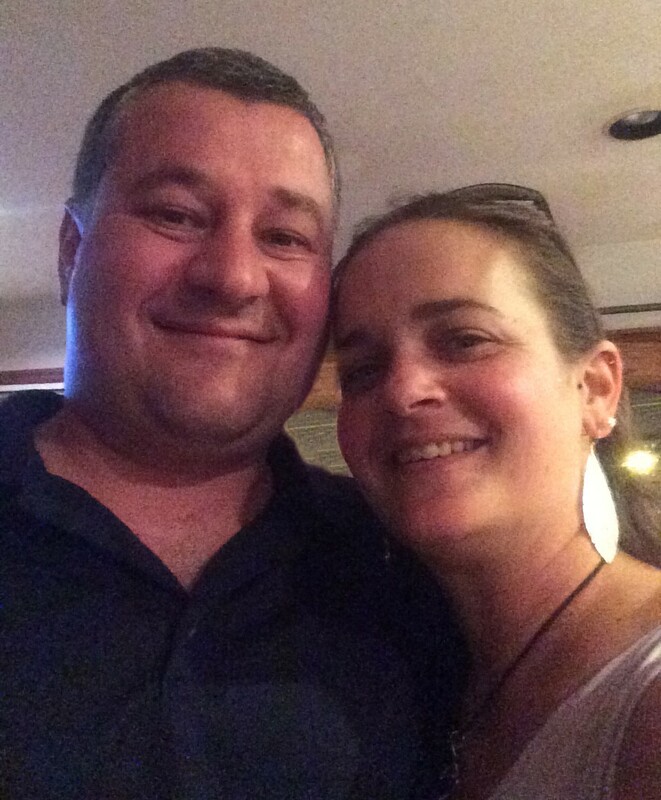 For horticulturist Heather Sherwood, the story began with a memorable date: 5/5/05. She worked late that day, and was ready to head for home when her beau came by and insisted on a stroll around the Garden to see the tulips in bloom. After quite a long walk, they came to the Graham Bulb Garden, where he asked her to look at something strange inside one of the bright red tulips planted there. Leaning in, she saw something…shining. He reached down, pulled out the diamond ring he’d hidden there, and proposed on the spot. 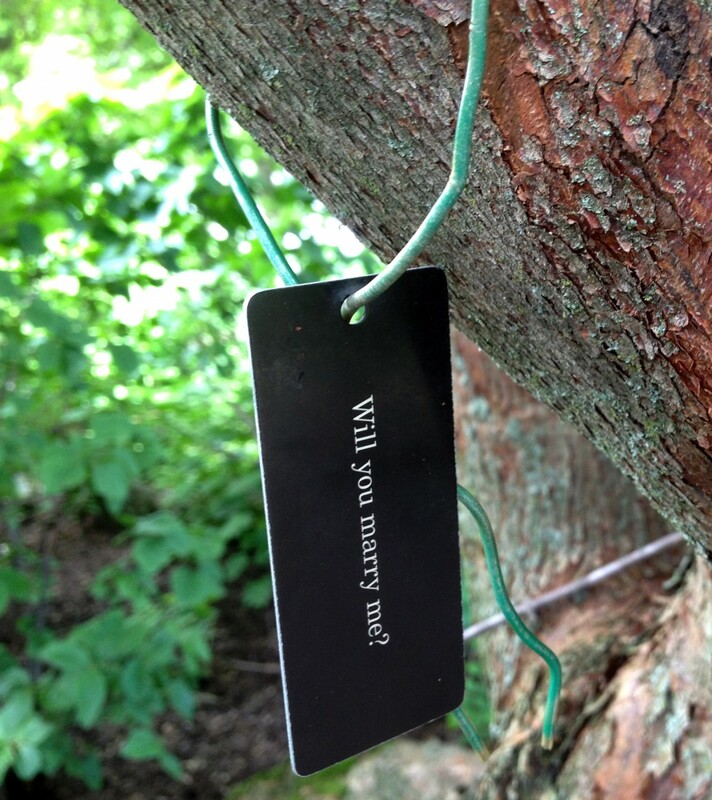 When you make a tribute gift of a tree at the Garden, a tree tag marks your personal dedication. See what other tribute dedications you can make here. It’s 25 years later, but the hybrid paperbark maple tree in the Waterfall Garden that bears the dedication “Will you marry me?” (Scott asked Laura; she said yes) is still called the “marry me tree” by our staff. A former horticulturist recounts having weeks of critter problems in the Heritage Garden, when a man dressed in a chipmunk costume sauntered into her garden, grabbed her, and started dancing. Turned out to be her future husband, who asked her there and then to marry him. Love: it’s in bloom at the Garden.